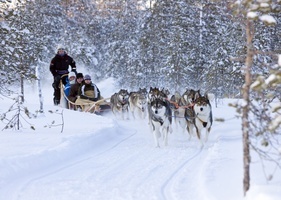 EXPERIENCE THIS UNIQUE JOURNEY TO NORTHERN NORWAY AND LAPLAND AND BE AMAZED BY A BLEND OF FIRST CLASS TRAVEL, WITH THE MOST FASCINATING AND INVIGORATING WINTER ACTIVITIES IN THE REGION. YOU WILL SAIL ALONG THE COAST FROM HARSTAD TO SVOLVAER AND EXPERIENCE AMAZING SCENERIES ON YOUR WAY. IN SVOLVAER A SEA EAGLE RIB SAFARI AWAITS YOU, FOLLOWED BY AN EVENING OF LOCAL HISTORY AND DINING. A 3-HOUR GUIDED TOUR WILL TAKE YOU AROUND THE CITY OF TROMSO BEFORE YOU GO LOOKING FOR THE NORTHERN LIGHTS AND VISIT WITH 300 HUSKIES. THE AWARD-WINNING ALTA MUSEUM IS ALSO ON THE LIST OF MEMORABLE VISITS. IN KIRKENES CHOOSE TO TRY ONE OF THE DELICACIES OF THE NORTH ON A KING CRAB SAFARI. YOU WILL STAY IN SAARISELKA WITH ITS DAZZLING WHITE LANDSCAPE AS WELL AS IN ROVANIEMI AND SINETTA, WITH ONE NIGHT IN THE EXTRAORDINARY ARCTIC GLASS IGLOOS. 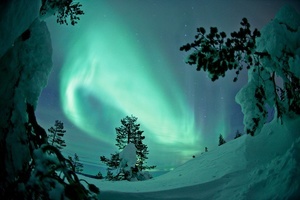 WEATHER PERMITTING, YOU WILL SEE THE BREATH TAKING NORTHERN LIGHTS FROM YOUR BED. 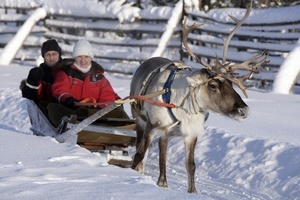 EXPERIENCE SANTA CLAUS VILLAGE AND VISIT THE HOME OF SANTA CLAUS IN ROVANIEMI. THE HIGHLIGHT OF THIS WINTER ADVENTURE IS THE ‘SAMPO’ ICEBREAKER SAFARI WHERE YOU HAVE A CHANCE TO TAKE A SWIM IN THE FRESH ARCTIC WATERS OF KEMI. Arrival to Gardermoen Airport in Oslo and transfer to the hotel on your own for check-in (not included). Please consult the our welcome letter, which you will receive upon check-in to your hotel, and kindly note where and when to meet your Tour Director. Get ready for a walking tour of the Norwegian capital. You begin your visit outside with a walk around the new Opera House, which opened in April 2008. From the spectacular outdoor terrace, you will be able to enjoy stunning views across the Oslo fjord. During the tour you will walk through the cosy Karl Johan walking Street where you can see the Royal Palace and the end. The tour will pass by Aker Brygge where you can admire the modern architecture of Oslo and perhaps enjoy dinner in one of the many cosy restaurants of this popular area of the capital. Return to the hotel by your own. Early breakfast at the hotel. Private transfer to the Oslo airport, from where you will take a direct flight to Harstad (included). Your private bus is waiting for you at Harstad/Narvik Evenes Airport and will drive you to Harstad. The trip to Harstad city is approximately an hour ride during which you will get many beautiful impressions on the way. Check in at the hotel. Early breakfast at the hotel. Your luggage will be transferred on land by your private bus for you to enjoy your time on the Hurtigruten even more. The pier from where the Hurtigruten departs is within walking distance from your hotel. Since 1893 the Hurtigruten ships been very well-known in the northern coast of Norway. Experience Norway’s most beautiful fjords, nice harbor and amazing sceneries on your way! From the panoramic lounge you will be able to see the magnificent nature of Norway. During your time on deck you will have time to enjoy lunch at your own. Upon arrival in Svolvaer you will check in to your hotel located right next to the Hurtigruten Terminal in Svolvaer. Evening at leisure. Breakfast at the hotel. Morning at leisure. Make yourself ready to meet in Svolvaer centrum at 11.00 where your RIB safari will start. Experience the magnificent Lofoten Islands by sea! With a bit of luck, you can see both eagles and seals, and a great variation of bird life on a trip to the Trollfjord. You will drive up the strait of Oyhellsundet and to the spectacular Trollfjord. Here you find historic sites, sandy white beaches (when there is no snow) and one of the most dramatic fjords of Norway. You also visit the whaling island Skrova with its charming harbour. All passengers will be outfitted with flotation suits. We recommend warm clothes as a base layer underneath as well as practical footwear. Svinoya is the oldest part of Svolvaer, and has been a thriving, vibrant fishing village since 1828. You will experience a living fishing village and learn about the culture. Your guide will talk about how the fishermen lived 100 years ago and what happened in the Trollfjord in 1890. Hear all the stories, ask all the questions and smell and taste the stockfish. Remember warm clothes, sensible footwear and your camera to be able to capture the memories. You finish your evening with a 3-course dinner at Borsen Spiseri – the most distinctive restaurant in the Lofoten Islands. The restaurant is housed in a venerable quayside warehouse dating back to 1828. The dishes you will be served are all made with unique, fresh and local ingredients from Lofoten. Breakfast at the hotel. Your journey continues by bus to your next destination Tromso. Your bus trip from Svolvaer to Tromso will take around 10 hours (400 km). 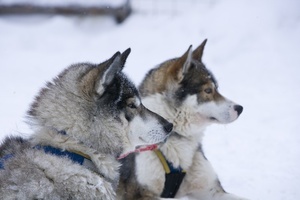 On your way you will take a stop at the famous Polar Park which is the world’s northernmost animal park. There you will have the unique opportunity to meet the wolves, bears, deer, elk and reindeer. A local guide will show you the park and tell you everything you want to know about the animals. If you feel hungry after the guided tour you can enjoy a delicious traditional Norwegian meal (not included) indoors in the cosy restaurant. After the visit at the Polar Park you will continue your journey to Tromso. Check in at your hotel. Evening at leisure. Breakfast at the hotel. The ride from Alta to Tromso is breath-taking regardless of the time of year. Stunning scenery and magnificent nature. This trip will be something that stay with you just a little longer. The distance between Tromso and Alta is about 300 km, the journey takes approximately 9 hours and include two ferry crossings. The tour will make a stop to enjoy lunch (not included) at the Bios Café in Storslett. Arrival in Alta and check in at your hotel. Evening at leisure. Breakfast at the hotel before departure. In the comforts of our coach you will make your way south from Alta to Saariselka. The journey takes approximately 6 hours, during which you will have the opportunity to take in the breath-taking beauty of the changing Nordic landscape. The tour will make a stop along the way to enjoy lunch (not included). Breakfast at the hotel followed by an early departure. You will be traveling the 270 km north to Kirkenes by coach, an approximately 4-hour journey transporting you through the beautiful northern Lapland. Your eyes will feast on breathtaking nature as you make your way up north. The tour makes a stop along the way to enjoy lunch. After check-in at Thon Hotel Kirkenes you will enjoy the amazing experience of the “KING CRAB SAFARI”, departing from your hotel at 13.00 hours. One of the highlights of Northern Norway with the chance to taste one of the local delicacies known worldwide. Heading out on the Kirkenes Fjord you will come face to face with this giant of the sea on the King Crab safari. The red king crab found in the Barents Sea can reach up to two meters from claw to claw and weigh up to 15 kilos. 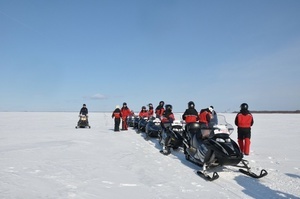 Depending on the weather and ice the trip might be by boat or snowmobile drawn sleigh. Once your king crab has been caught, you are transferred to a remote cabin where the crab will be prepared for a delicious lunch. All equipment and clothing will be provided. The rest of the afternoon is at leisure. Depart Kirkenes travelling south through the northern Lapland landscape to the centre of Sami world at Inari, the capital of Lapland. Here we visit the Sami culture centre and parliament set in the heart of Sápmi in a unique natural landscape on the shore of Lake Inari, serving as a centre for Sámi self-governance, culture, education and know-how. Modern conference premises, facilities and technology go hand in hand with authentic, living Sámi culture. Lunch is included. After the visit we continue onto the tiny village of Saariselka, the centre of Finland’s winter sports. Check-in to the hotel and the rest of your day is at leisure. 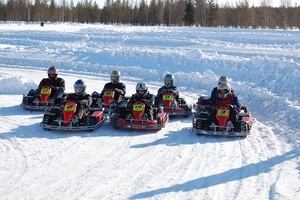 *Note: To drive a snow mobile in Finland you must have a valid driver’s license from a country of issue which has signed the Road Traffic Convention of Geneva. Our company cannot accept responsibility for licenses that are not accepted. Please consult if you have any doubts. Put on your snowshoes and feel the crunch of snow under your feet. Capture the true feeling of winter in the northern woods as you explore the nearby white wilderness of forest and hills and Urho Kekkonen National Park, surrounding Saariselka. The afternoon is at leisure and we recommend trying a Finnish sauna, available at the hotel. The day continues with a visit to the world-famous Santa Claus Village, built right on the Arctic Circle and home to Santa Claus. Stop by his busy post office where you can ask Santa to send a letter to your loved ones just before Christmas. Take a step into the magical world of Santa’s home and meet Santa himself. No words can describe the emotions of this fairy-tale-like moment. It is something you will always remember. An absolute must for any visit to Lapland. The rest of the afternoon and evening are at leisure. Time for a swim as we head to the town of Kemi for a full day of activities. First a visit to the Snow Castle* with its special snow slide. Enjoy the snow sculptures and complex. Later you will experience one of the highlights of your winter adventure as we board the Sampo Icebreaker and spend 4 hours on this unforgettable vessel breaking though the ice of the northern Gulf of Bothnia. *Please note! The dinner included in the program will apply a supplement of EUR 150 for group 1 due to the special New Year’s Eve Dinner. Regular Transfer Services included in the program are only available for transfers from Harstad Airport & to Rovaniemi Airport and only on the published official date of end of the tour. Arrival transfer from Gardermoen Airport Oslo is not included. The transfers are escorted by an English-speaking representative from Borealis Destination Management and is shared with other fellow passengers; therefore, minor waiting time at the airport may occur. This transfer service is not valid for passengers with pre/post nights or passengers who require private transfers – for a supplement, private transfers can be reserved. Please note! The dinner included in the program will apply a supplement of EUR 150 for group 1 due to the special New Year’s Eve Dinner.